On Tuesday, the HindustanTimes published an article dealing with the manner in which India’s new Prime Minister Narendra Modi uses social media as a tool for digital diplomacy. According to the article, India’s Prime Minister uses social media sites such as twitter in order to engage with local and foreign publics as well as with other world leaders. By commenting on domestic and foreign matters, Modi seems to be utilizing digital diplomacy in order to reach ever growing audiences. India’s Prime Minister is not the only world leader to use social media as a tool for communicating with local and global audiences. The 2014 twiplomacy study revealed that leaders throughout the world have flocked to twitter and routinely tweet messages dealing with issues ranging from their private lives to their nation’s foreign policy agenda. While the Twiplomacy study reveals the global appeal of world leaders it does not answer an important question and that is how are world leaders using twitter de facto? Do they view it as a tool for communicating with audiences, or as a tool for transferring information to audiences? In other words, do leaders use Twiplomacy as a digital diplomacy tool that allows two way communication and dialogue or as a public diplomacy tool that enables one way communication and monologue? In order to answer this question, I decided to evaluate the twitter accounts of eight world leaders. My sample included leaders which were identified as the most popular on twitter by the 2014 Twiplomacy study shown below. The leaders included in my sample were US President Barack Obama, The Pope, Indonesian President Susilo Bambang Yudhoyono, Indian Prime Minister Modi, The Prime Minister of the United Kingdom and the President of Argentian Cristina Fernández de Kirchner. Finally the sample also included the account of Israeli Prime Minister Benjamin Netanyahu. 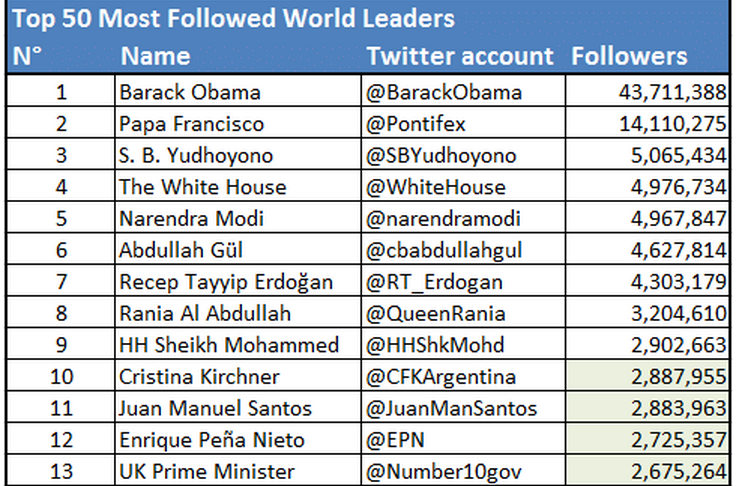 In order to characterize the manner in which world leaders use twitter, I analyzed all tweets published by these leaders over a three week period (13/08/2014-02/09/2014) searching for instances in which leaders engaged with their online followers. I defined engagement for the purpose of this small study as instances in which leaders respond to tweets posted by followers either by answering questions, replying to comments, supplying information requested by followers and re-tweeting tweets posted by followers. My analysis included more than 1,000 tweets posted by both world leaders and their online followers. The results of this analysis were somewhat surprising. While the leaders in this sample extensively use twitter, averaging more than 10 tweets per day, and while most tweets generate dozens if not hundreds of comments, only one world leader was found to engage with followers and that is the account of the Prime Minister of the UK. All other world leaders did not engage with any followers during the three week period. I was especially surprised that Israeli PM Netanyahu did not engage with followers given the fact that during the time period of this study Israel was engulfed in yet another round of violence with Hamas that included a Twiplomacy blitz aimed at global audiences and foreign policy makers. With regard to the engagement observed between the Prime Minister of the UK and his twitter followers, in both instances some branch of the British government responded to questions posted by followers. 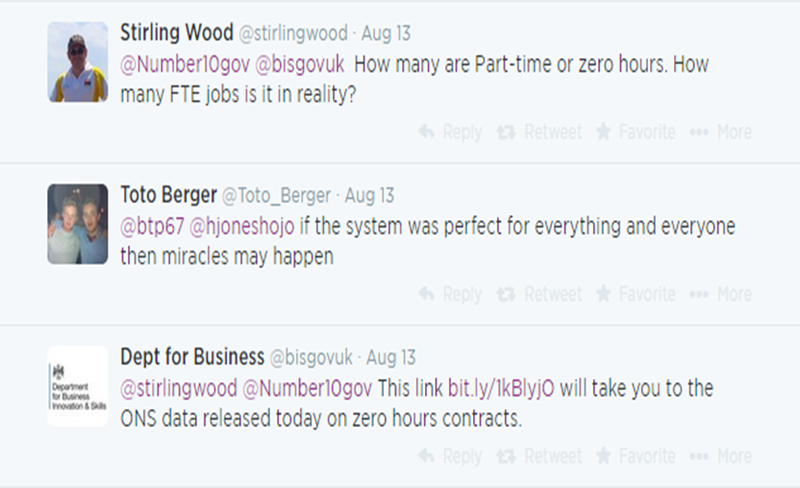 Such is the case in the example presented below in which the British Department for Business answers a query posted by the user @Sterlingwood. Although these are interesting examples of engagement, the fact that only two cases of engagement were observed over a three week period could indicate that like other world leaders, the UK’s Prime Minister uses Twiplomacy as a tool for transferring information and not as a tool for continues engagement with local and global followers. By so doing, world leaders are ignoring the potential of digital diplomacy and are using Twiplomacy as a mass communication tool much like the radio. Of course, one cannot expect world leaders to spend all their time answering questions and responding to comments posted by their online followers. Due to this limitation, some leaders invite followers to present them with questions under a specific hashtag. These leaders than answer such questions at a later time. Such is the case in the example below in which former US Ambassador to the UN Susan Rice asked followers to engage with her under the hashtag #AskRice. This enabled Rice to engage with followers but at her convenience. By asking followers to submit questions and answering them at later times world leaders can realize the potential of digital diplomacy in a manner that is not time consuming. Finally, I find myself wondering if other national leaders do engage with their followers. For instance, as foreign ministers are in charge of diplomatic activity it is possible that they have more fully adopted the spirit of digital diplomacy. Likewise it is possible that leaders engage with followers more openly when on the campaign trail and stop doing so once they have taken office at which time all their tweets are formulated by dozens of aids as was the case with India’s new Prime Minister.